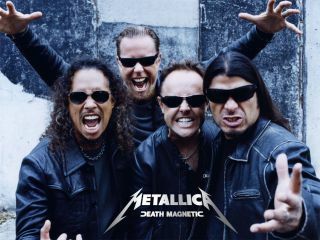 To the surprise of probably no one, Metallica's Death Magnetic nabbed the top position on the UK album chart - ahead of the Scottish band Glasvegas, whose self-titled debut came in at a robust number two. Although scheduled for release on Friday, September 12, Death Magnetic dropped early, reaching some stores on Wednesday, others on Thursday, and racked up sales of 75,164 by close of business on Saturday - the highest number one tally for 11 weeks. Metallica's number one debut bested Glasvegas's sales by just over 20,000 copies. Glasvegas's overall sales figures for the week were 56,387- not bad for a brand-new band going up against a metal behemoth. Glasvegas's James Allan said he never dreamed of beating Metallica. "I was surprised at how many it [the Glasvegas album] was selling," he said. "But I knew Metallica were going to bring out an album in the same week. They're enormous. If it was the biggest R&B artist in the world [it would have been the same chart situation]. That's the kind of level they're at. They're the biggest metal band in the world." So, apparently, everybody's feeling good. To celebrate their chart dominance, Metallica performed their smallest London gig in years last night (September 14) at the BBC Radio Theatre in Broadcasting House. Other, less intimate appearances will follow this week, such as a fan club-only show at the London02 Arena tonight, andTV spot tomorrow (September 16) on Later...With Jools Holland, which will be broadcast Friday.